Several of you have note that it is not the cool temperatures or even the rain that bothered you this last few months, but the lack of sunlight--sort of like a summer version of seasonal affective disorder (SAD). So what is the truth about clouds this spring and summer? In such situations there is ONE expert on our local murk that I trust, a local scientists who has spend a great time looking a the climatology and trends of local clouds. I have mentioned him before---Dr. Jim Johnstone, AKA Dr. Fog, a researcher here at the UW. 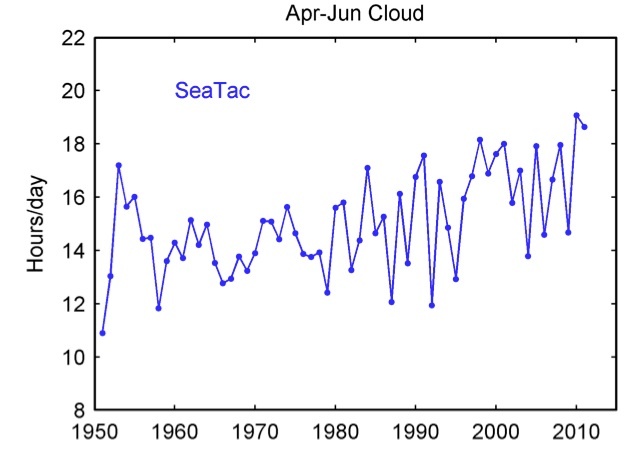 Here are some of his depressing results--the average number of hours a day with clouds at Sea-Tac for April through June. 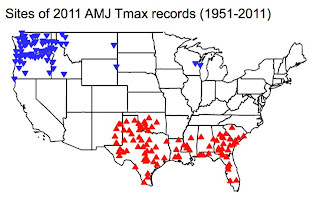 2010 and 2011 have simply been the worst over the past 60 years. We are talking about 18-19 hrs a day of cloud on average. 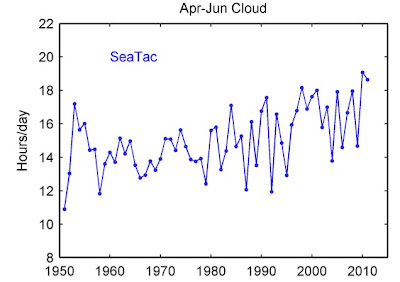 And the general trend the last few decades is for more clouds. Now you will hate me for telling you this... but I have a project with Dr. Eric Salathe to simulate Northwest weather under global warming. Guess what. These high-resolution simulations suggest more low clouds west of the Cascades as the interior heats up. More interior heat causes the pressure to fall to the east and global warming seems to be associated with a stronger East Pacific High--the result: more low clouds offshore and more onshore flow. And what about his results for temperature? Here are the April-June temperatures for the entire state. I bet you know which year was the coolest. This year. It is in a class of its own. 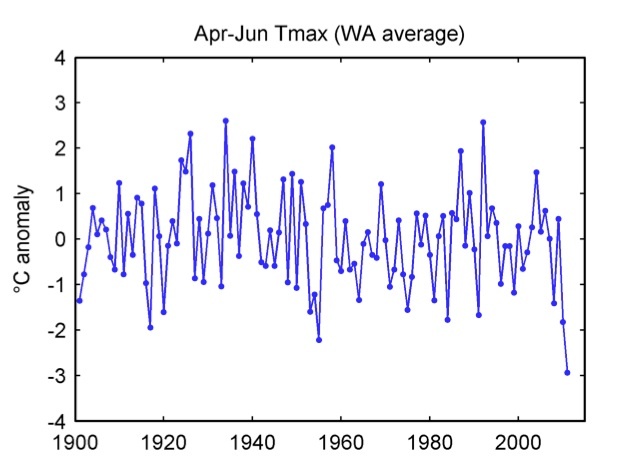 Or how about a plot of where the daily maximum temperature records (both record high maximum and record low maximum temperature) have occurred this year during April-June? 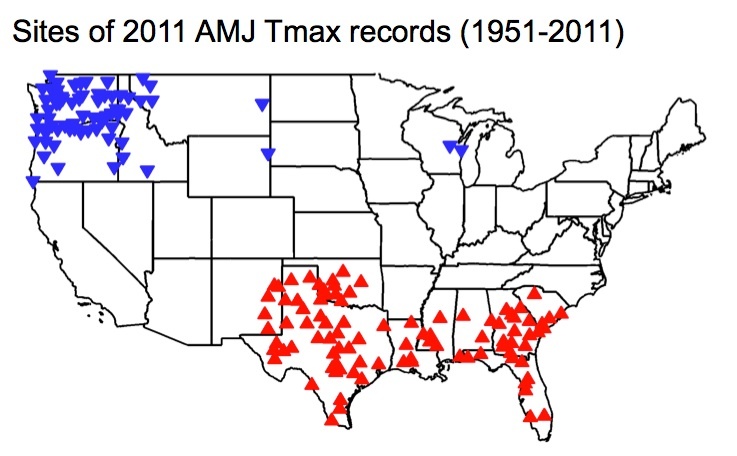 The big concentration of record low maxima (blue symbols) is over the Northwest, while record high daily maxima were found over the southeast. But if you really want to get into the murk, take a look at the amount of radiation measured at the top of the atmospheric science building at the UW. On July 25th the UW's sensor's measured 4.51 megajoule (unit of energy) per square meter, the darkest day in almost 4 months. On a bright sunny day we would be up in the low 30s. 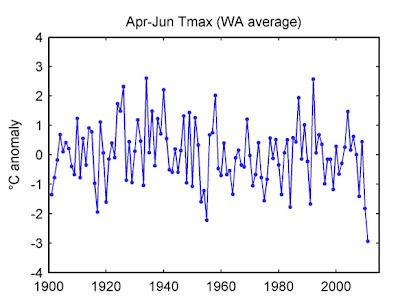 Not since 4 April 2011 with 3.47 MJ/m2 have we seen a darker day in Seattle as measured at the U of WA. This weekend....below normal temps but perhaps acceptable. A disturbance approach from the north will get mighty close on Sunday, so go south and east for better weather. 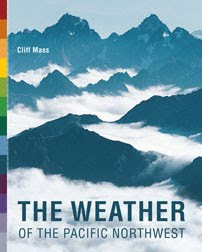 So if the weather west of the mountains in a probable global-warming scenario means more clouds, what do you predict for folks of us inlanders on the east side of the Cascades? Do you think we may likely have more clouds, too? So does this mean that our summers will have more of a California coastal-foggy climate, i.e. their weather, moving up the coast? If I had to make an educated guess, i'd say there would be less clouds and more wind in Eastern. Invest in more wind power? Interesting thing, even with strong systems and westerly flow aloft, I feel like its been a unusual calm summer wind wise. In your book, you have a wind graph with Ellensburg ranging 14-16mph for this period. But the 12 week time series shows an average of 11.5 knots this year and only 6 knots in my windy location. That's below average. I have a question for Dr. Mass (or for whomever can answer). My family and I took the easy hike up to the Big Four Ice Caves last week. I was deeply impressed by the extent of the snow this late in the season. I understand from Dr. Mass that La Nina has ended, and with it, the very large snow fall. Looking at the topographical maps around big four, and the obvious glacial scarring, it appears reasonable to speculate that the ice caves are all that remain of the glacier that poured out robe valley. With all of the heavy overcast extending into the late season, after having had an abnormally high snowfall, I'm led to wonder about the dividing line between a glacial period and a warm period. Would it be possible, even in the face of global warming to trigger at least local glaciation? One could imagine, as we have witnessed the bizarrely tenacious Arctic pressure system Dr. Mass mentioned a few days ago, perhaps lasting an entire year (or years). If that happened, would the Cascade glaciers ever be able to grow back? Even in the face of global warming? Caveat - I did say "imagine". I'm just curious what informed folks might know about the subject. Is it possible that the lingering cooler sea surface temperatures off the north pacific coast, and current atmospheric circulaton characterist of La Nina might be contributing to our cloudy and cool summer? On a side note, we are also due for the results of the CLOUD experiment at CERN some time this summer, but it looks like the results will not be allowed to be publicly interpreted by the research team: (http://www.theregister.co.uk/2011/07/18/cern_cosmic_ray_gag/). TThe recent temperatures, albeit cool for summer, have been o.k. in my book. My issue has been with what seemed to be an excessive amount of dark cloudiness, for the second summer in a row. 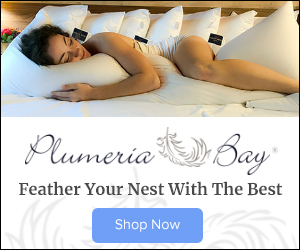 We get it guaranteed for 7-8 months of the year. It was nice to be able to count on three months of beautiful sun to make up for the long grey periods. Several days ago, I plotted some charts with sky cover data from the NWS Climate Data site for Sea-Tac as a data visualization exercise. Both of these unscientific charts show similar patterns to the ones on this blog entry, though for much shorter time periods. Just two more ways of looking at similar data. I noticed that the map of low maxima are evenly distributed east and west of the Cascades. Do you mean the "interior" of the continent, or the interior of WA, heating up would be accentuating the onshore flow? We have a DR. FOG? What a riot! Comment on Robert's question re the Big Four "Ice" Caves - it's just a snow chute from avalanches off Big Four that never completely melts. Must still be big this year! BTW - I assume the road's still washed out at the Red Bridge and you cycled in? I was just curious if this is the coolest summer in 60 years what happened 60 years ago. So apparently somewhere in WA had a record high?